The DAC is a high quality digital to analogue converter, equipped with remote control and designed to convert the digital signals, up to 192 kHz sampling frequency, to the purest analogue audio levels to feed directly into a power amplifier or pre-amplifier. The DAC offers over sampling and 24 bit conversion. The DAC has inherited the fabulous electronic design of the Nagra D and Nagra V digital recorders used by the most prestigious music companies and recording engineers in the world. These exceptional machines have convinced the engineers that digital audio could convey the emotion and warmth of analog tape recorders and long play disks that they miss with other digital formats. The DAC was designed with the same ingredients and philosophy to provide you with state-of–the-art technology respecting your music. The Nagra DAC is the result of 50 years of experience in high-end audio technology. As other Nagra products, it ignores all compromises on quality. Nagra has already demonstrated that whatever the technology – tube or solid state – its products offered ultimate musicality and transparency. With the DAC, this philosophy now extends to the digital Hi-Fi world. High-End Audio the DAC provides a 192 kHz 24 bit up sampling to all incoming signals. Even 16 bit resolution formats such as CD enjoy a smooth and elegant signal conversion. The DAC features an ATF (Adaptive Time Filtering) module that increases the quality of all signals just before the conversion stage by eliminating the jitter. The electronic circuit boards are made up of four layers. As no computer-assisted software design meets our demanding specifications, the tracks are conveniently routed to keep the integrity of the signal. The signal-to-noise ratio is very large and inter-channel crosstalk has been maintained at the lowest possible level. The DAC features Nagra’s Remote Control Unit. It allows access to all parameters, including navigation into the menu. In addition one RCU can control other Nagra devices like MPA and PL-L. The DAC offers both electronically balanced outputs on XLR and unbalanced on RCA. Optional custom-designed Nagra-made transformers are also available for floating output. The 7 different inputs can be selected as well as the main volume and balance adjustments. A large LCD screen permits an overview of the selected input signal as well as the automatic settings, number of bits, output level, etc. The same LCD screen in combination with the 5 function keys allows surfing through the different menus. Settings like contrast, back light level, LED brightness, etc. can be manipulated. On the left side of the LCD screen, the automatic selected sampling frequency is shown by the corresponding LED. 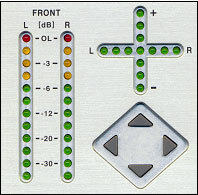 The green cross on the second panel gives a clear overview concerning the adjustments of the output level and the balance position. Two bar graphs indicate the audio output level. The arrow keys give direct access for adjustment of the volume and balance. From the main menu, the brightness of the LED’s can be selected as well as the choice of lights for bar graph or dot lightning.